The Ambassador of the Custodian of the Two Holy Mosques in Australia, H.E Nabil Bin Mohammad Al Saleh has emphasised the importance of the recent visit of the Trade and Investment Minister Andrew Robb and various other senior Australian businessmen to the Kingdom of Saudi Arabia and the Gulf Countries. The Ambassador has stated that this was an excellent opportunity for Australia to build and strengthen extensive trade relations with key partners in Saudi Arabia and across the Arab world. 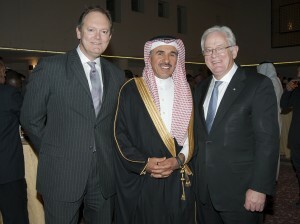 He also stated that this visit reflected the current strong trade ties between Australia and the Arab world. During their two day visit to Saudi Arabia the Trade Minister and his delegation met with a large number of senior officials in the Kingdom, including the Minister of Commerce, Dr. Tawfiq Al Rabia, the Minister of Economy and Planning, Dr Mohammed Bin Suleiman Al Jasser, the Minister of Agriculture Abdul Rahman Bin Abdul Mohsen Al Fadhli, the Governor of Saudi Arabia General Investment Authority (SAGIA), Abdullatif Bin Ahmed Al Othman, GCC Secretary, Abdul Latif Bin Rashid Al Zayani, Deputy Minister of Finance, Dr Hamad Bin Sulaiman Bazei and also the Vice Chairman of the Chamber of Commerce, Mr Saleh Bin Hassan Afaleq. 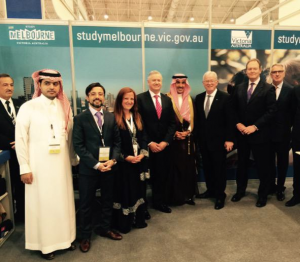 On his part, the Australian Minister of Trade, Andrew Robb, stated that his trip was an important opportunity to extend their trade relations with Saudi Arabia. Minister Robb also emphasised the importance of resuming free trade negotiations with the Gulf Cooperation Council States. Minister Robb also attended a meeting with the Saudi Business Council of Australia held in the Saudi Chambers in Riyadh Council. This meeting was headed by Abdul Latif Bin Misfer Al Zahrani on the Saudi side and Tom Harley on the Australian side. H.E Ambassador Nabil Al Saleh was also in attendance, along with Ambassador of Australia to the Kingdom Ralph King. During this meeting the two sides discussed bilateral relations between the two countries, particularly in regards to the fields of economy and investment and ways of enhancing them on both sides. Trade and Investment Minister Andrew Robb has visited the United Arab Emirates and the Kingdom of Saudi Arabia to promote commercial opportunities for Australia business in two of the region’s leading markets. The trip took place over three days. During the trip. Mr Robb participated in Austrade’s annual regional promotion Australia Unlimited Gulf, which showcased Australian capabilities in education, agriculture and food, resource and water management, urban development, rail, sports and tourism. “There is a strong fit between demand in the Gulf and Australia’s strengths. Both the UAE and Saudi Arabia are investing in infrastructure and restructuring their economies; creating opportunities in sectors where Australia has a proven track record,” Mr Robb said. Mr Robb also met with senior Ministers in the UAE and Saudi Arabia to advocate for a resumption of negotiations for a free trade agreement with the Gulf Cooperation Council. Prior to his trip, Minister Robb stated that “I will use my visit to set out the Australian Government’s trade and investment agenda. To emphasis that Australia is open for business and that we are committed to deepening our economic engagement with region,” Mr Robb said. Mr Robb also met with some of the region’s most important investment funds. The UAE and Saudi Arabia have large sovereign wealth funds with total assets of US$1.7 trillion and are looking to make new international investments into food security, agriculture and infrastructure projects. In Riyadh, Mr Robb also meet with the more than 20 Australian Universities and education providers attending the International Exhibition and Conference on Higher Education and promote Australia as an education destination. “Gulf countries face challenges in providing education and skills development for their growing and youthful populations. Australia offers world-class opportunities for international education, as well as education and training services delivered in-market,” Mr Robb said. Mr Robb noted the growth in aviation links between Australia and the Gulf–with more than 140 flights a week – will deepen business links and facilitate growth in the number of tourists from the region. Mr Robb also opened the Council for Australian Arab Relations’ ‘Food Water Energy Nexus’ policy seminars in both Abu Dhabi and Riyadh, which brought together various experts to discuss issues which are both challenges to Australia and the region.